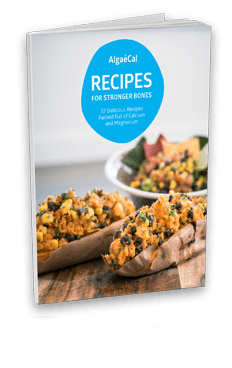 Lara Pizzorno is the author of “Your Bones: How You Can Prevent Osteoporosis and Have Strong Bones for Life – Naturally” and a member of the American Medical Writers Association with 29 years of experience specializing in bone health. Recently we asked Lara if she would help us provide a series of short, ongoing videos to help you (our customers and readers) stay up to date on the latest facts and science related to bone health and overcoming osteoporosis naturally. Hello. My name’s Lara Pizzorno. 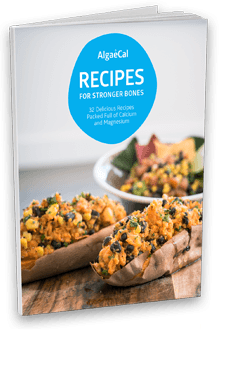 I’m the author of “Your Bones,” and I’m here to share some information with you that I hope will help you to have healthier bones. 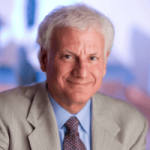 In the last several video clips, we’ve been talking about the latest research that shows that bariatric surgeries, both the Roux-en-Y gastric bypass and the sleeve gastrectomy, which are the two most popular forms of weight loss surgery, cause bone loss. Bone loss begins immediately after these surgeries, and it keeps on going for as long as any study conducted so far has checked. In some of the studies, data has been neglected now for ten years. While researchers are still working out why this is happening, our immediate question is, especially if you or someone you love has had or is considering gastric bypass or a sleeve gastrectomy surgery, what can you do right now to promote healthy bone remodelling? And that’s the topic of this video. So here are a few comments and suggestions. First of all, make every bite count. If you’ve had Roux-en-Y or a sleeve gastrectomy surgery, the amount of food that you can consume has been greatly reduced. 85 to 95% less can be consumed by you now. Choose the most nutritious foods and focus on the foods that are richest in bone-building nutrients: calcium, magnesium, boron, and the other trace minerals, vitamin C, the B vitamins, and many more. I’ve discussed all of these nutrients and their best food sources in the second edition of “Your Bones.” And I will be talking about all of them in future videos here on AlgaeCal’s website. To maximize the nutrient density of the foods that you can eat, eat organic. Many studies have now confirmed that organically-grown foods and meats and dairy products from pastured animals that eat grass, rather than grains or corn, and wild-caught, rather than farm-raised fish, and free-range eggs deliver way more of the healthy nutrients that our bones and the rest of our bodies require than do conventionally-produced foods. Take supplements. When 85 to 95% of your stomach has been removed, you definitely cannot rely on the greatly reduced amount of food that you’re now able to consume to provide you with adequate nutrition to prevent bone loss. You need a high-quality, high-potency multiple vitamin and mineral supplement that can be taken in divided doses throughout the day with your meals. Supplements don’t require digestion. The nutrients that they contain do not have to be released from the food matrix in which they are found. Nutrients and supplements are immediately released in the stomach, which greatly enhances your chances of being able to absorb more of them as they pass through what remains of the rest of your digestive tract. Not only are you able to consume much less food, but the small remnant of your stomach that is left does not contain the parietal cells that produce the stomach acid that all of us require to digest our food and to solubilize calcium, which is the process necessary for calcium to be able to be absorbed. Because of this, please talk with your doctor about taking stomach acid as a supplement along with your food. In supplement form, stomach acid is called hydrochloric acid. Typically, it’s paired with another compound called betaine, B-E-T-A-I-N-E, in these supplements. So the label will read “hydrochloric acid with betaine.” It’s very inexpensive and should be available at any health food store or online. In addition, as we’ve discussed in other videos in this series, if you’ve had gastric bypass, both your duodenum and the uppermost section of your jejunum, the first two parts of your small intestine, have also been bypassed. And these are the first sections of your small intestine where the majority of nutrients are absorbed and where you produce intrinsic factor. This is a compound that we need for us to be able to absorb vitamin B12. You’re not going to be able to produce it anymore. So for this reason, if you’ve had gastric bypass, please ask your doctor about taking a sublingual form of vitamin B12 as a supplement. Sublingual simply means that you put the supplement under your tongue in your mouth and it dissolves there. And the B12 will be absorbed directly into the capillaries in your mouth rather than having to go through your digestive tract. In particular, ensure that you are taking enough supplemental calcium and vitamin D and vitamin K2 in the form of MK7 to supply your bones with these key nutrients. Even in individuals who have not had any form of bariatric surgery and, therefore, have an intact digestive system, only 10 to 15% of dietary or supplemental calcium will be absorbed if they do not have adequate amounts of vitamin D.
If you have had gastric bypass surgery or sleeve gastrectomy, the part of your intestine where the fat soluble vitamins like vitamin D are normally absorbed have been bypassed. For this reason, you may need more vitamin D than the average person. To determine how much supplemental vitamin D you require, have your blood levels of 25(OH)D tested. This is the form in which vitamin D circulates in the blood stream, and optimal levels are 60 to 80 nanograms per ml. The Vitamin D Council now offers a finger-prick test that you can request online and mail back to them. So you don’t even have to go to a lab and have a blood draw. A link to this test will be included here with the references for this video. Take 1,500 milligrams of calcium daily, in 5 doses of 300 milligrams per dose, spaced throughout the day with your meals. As discussed in earlier videos in this series, calcium absorption after bariatric surgery is greatly decreased. And we know that we absorb more calcium when smaller doses are consumed at one time. Do everything that you can to maximize the amount of calcium that you can absorb. In addition to calcium and vitamin D, you also need vitamin K2 to make sure that the calcium that you do absorb goes into your bones. Vitamin K2 activates the proteins that are responsible for putting calcium into our bones and keeping it out of soft tissues in our bodies like our heart and arteries, kidneys, brain, and breasts. As with vitamin D, if you’ve had a gastric bypass, your digestive tract will be able to absorb less vitamin K2 per dose, because as we’ve talked about in earlier videos in this series, the part of your digestive tract where bile comes in and helps us absorb fats and fat-soluble vitamins, like vitamin D and vitamin K, has now been bypassed. For this reason, to improve your chances of absorbing more vitamin K2, ask your doctor about taking a larger amount of this vitamin than the average person requires. It would be very safe for you to take the amount that is now being recommended for individuals with kidney or cardiovascular disease. This amount is 360 micrograms per day. And you are likely to absorb more of it if you take it in divided doses throughout the day with your meals. No adverse effects of any kind from MK7, the MK7 is a form vitamin K2, have been seen even when this vitamin is consumed in amounts greater than 800 micrograms a day. So 360 micrograms is very, very safe. Supplement with more than just calcium and vitamin D and K2. Bones must have not just calcium along with vitamin D to boost its absorption and vitamin K2 to ensure the calcium gets delivered to bone. Our bones also require magnesium and boron and vitamin C and numerous trace minerals, all of which play very important roles in healthy remodelling. And for this reason, I suggest you rely on AlgaeCal Plus, which provides all of these nutrients as your calcium supplement. 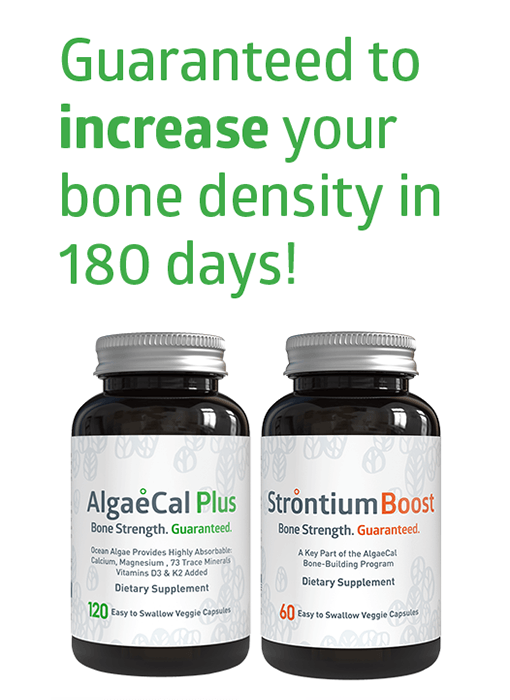 AlgaeCal has demonstrated its ability, in large human studies that have been published in the peer-reviewed medical journals on PubMed, to help even post-menopausal women who already have osteoporosis to turn it around and build new, healthy bone, and not to just slow down the rate at which bone is being lost, which is all that all other calcium supplements have ever been shown to do. 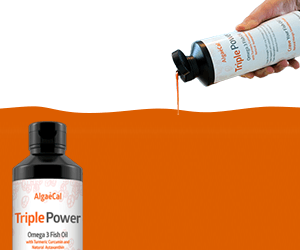 AlgaeCal’s effectiveness in restoring health to our bones is due, I believe, in significant part to the fact that AlgaeCal is not just calcium. 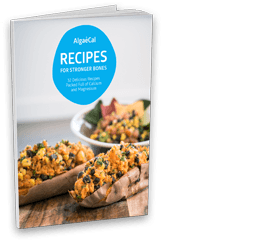 In addition to four different kinds of plant-derived calcium, AlgaeCal contains all the trace minerals, some 70 of them, that the sea algae use to build its bony skeleton. In addition, AlgaeCal contains boron, magnesium, and vitamin C. And all of these nutrients work together, and all of them are needed to form healthy bones. Because of this, if you’ve had gastric bypass surgery or sleeve gastrectomy, choosing AlgaeCal as your calcium supplement may be especially important and especially helpful for you. Identify and eliminate, as much as you possibly can, all sources of inflammation. Anything that promotes chronic, low-grade inflammation will activate osteoclasts. These are the specialized cells that break down bone, and thus, inflammation promotes bone loss. For example, what medications are you taking regularly? Do any of them promote bone loss? If so, ask your doctor to help you find another medication less likely to do so. Ask your doctor to check your blood levels of that highly pro-inflammatory compound we talked about in an earlier video called homocysteine. If your homocysteine levels are elevated, consider taking supplemental B vitamins, which can help you keep your homocysteine levels down. Optimally, if your homocysteine levels are elevated, ask your doctor’s help in finding a B vitamin supplement that contains the already active forms of these B vitamins. The activated form of folate is methyltetrahydrofolate. The activated form of B6 is pyridoxal 5′-phosphate. The activated form of B12 is methylcobalamin. And the activated form of riboflavin is flavin adenine dinucleotide or FAD. Are you getting adequate rest? In addition to making you feel lousy, insufficient sleep promotes inflammation. Minimize your exposure to pro-inflammatory chemicals, for example, pesticides. This is another reason to eat organic. Pesticides promote inflammation in the body. Endocrine disruptors, examples here are Bisphenol A and other plasticizers, cigarette smoke and heavy metals, such as the mercury in dental amalgams, lead, and cadmium. All of these contribute to chronic inflammation and, therefore, to bone loss. Lastly, enjoy regular, weight-bearing exercise. When we engage in weight-bearing exercise, we put stress on our bones. And we now know that by doing so, we wake up special cells in our bones called osteocytes, O-S-T-E-O-C-Y-T-E-S, osteocytes. And these special cells sense that our bones are being challenged. Once awakened by exercise, our osteocytes slow down the production of a protein called sclerostin, S-C-L-E-R-O-S-T-I-N, sclerostin. And sclerostin, if it’s not inhibited, slows down the production of our bone-building cells, the osteoblasts. To sum up, what can you do right now to protect your bones? Make every bite count. Maximize the nutrient density of the foods you eat and minimize their potential to promote inflammation by choosing to eat organic, whole foods. Take supplements. A high-potency, multiple-vitamin and mineral supplement is a necessity. And talk with your doctor about taking stomach acid in the form of supplemental hydrochloric acid with betaine. Let’s see . 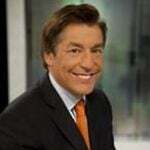 . . And you also want to talk to your doctor about taking a sublingual form of vitamin B12. Ensure you are taking enough supplemental calcium and vitamin D and vitamin K2, in the form of MK7, to supply your bones, not some average person’s bones, but your bones with the special needs that they have for these key nutrients. Identify and eliminate, as much as possible, all sources of inflammation. And enjoy some type of weight-bearing exercise every day. And have fun! Spring is the perfect time for a walk in the sunshine. You can make your own vitamin D and wake up your osteocytes when you smell the flowers. I hope that these videos about the serious adverse effects of bariatric surgery on our bones will help you or will help someone you love to get all the weight loss benefits of bariatric surgery and bariatric surgery’s other health benefits without sacrificing the health of your or their bones. 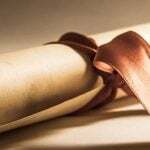 As new research is published, I will do my very best to keep you abreast of any developments that may help you. Thanks for tuning in. Crinnion WJ. Organic foods contain higher levels of certain nutrients, lower levels of pesticides, and may provide health benefits for the consumer. Altern Med Rev. 2010 Apr;15(1):4-12. Review. PMID: 20359265. Pizzorno L. Your Bones, 2nd edition. Praktikos: Edinburgh, VA, 2013. 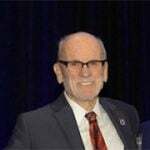 Best-selling author of “Your Bones: How You Can Prevent Osteoporosis and Have Strong Bones for Life – Naturally” and a member of the American Medical Writers Association with 30+ years of experience specializing in bone health. 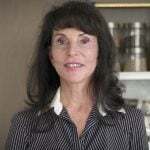 Lara is the Editor of Longevity Medicine Review (www.lmreview.com) as well as a Senior Medical Editor for SaluGenecists Inc., and Integrative Medicine Advisors, LLC. Thank you so much for a very informative article that addresses the real issues post bariatric surgery. You recommend sublingual B-12, but what is your opinion about Vitamin D3 and Vitamin K2 (NOW brand) oral sprays? My husband had this surgery and he takes daily supplements but his Vitamin D level is low, below 30. I’m considering purchasing a Vitamin D sun lamp. As a side note, I recently noticed that my husbands bariatric vitamin (Bariatric Advantage)contains NO vitamin K. I asked his doctor on a recent visit and he told me many patients are on anticoagulants. If your husband is low in vitamin D, he should get a vitamin D test (ask this of your doctor) only then will you know how much vitamin D3 he will need per day to get him back up to optimal. Once you know this, you will know how much he must take per day. The easiest way to monitor and follow this would be to take vitamin D3 supplements instead of a sun lamp. I am not familiar with the NOW sprays, but you should look at the label, telling you how much you are getting in each ‘serving’. 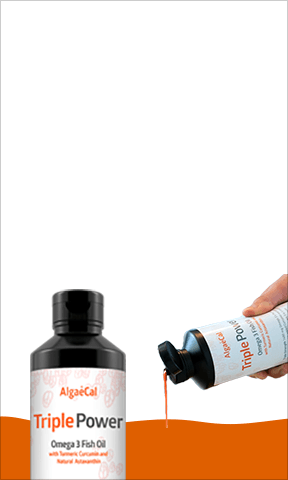 50 mcg of vitamin K2 is what is in AlgaeCal Plus (per daily dose) and recommended. If your husband is not on anticoagulants, then he can take vitamin K.